While millennials make up 56 percent of the rental market, there’s been a lot of buzz surrounding Generation Z (Gen Z) renters, their rental preferences and how landlords should market to them. According to Forbes, Gen Z comprises of 74 million people, making it equal in size to millennials and baby boomers, even surpassing Gen X. Even though members of Gen Z are currently under 22 years old, it’s only a short time before they graduate from college and head into the rental market. If you rent to college students, you should already be getting familiar with the preferences of Gen Z renters. It’s never too early to start thinking about the up and coming generations, so you can put together a marketing game plan that will attract and retain this generation of renters. Start getting to know Gen Z and their expectations from the rental market with our helpful article and infographic below. While the lines have not decisively drawn, Gen Z are generally known as individuals born between the mid-1990s and 2010. They are the generation born after the millennials, and the oldest members have just reached their twenties. Just as the millennials caused shifts in the housing market, the same will likely be true of Gen Z cohorts as they obtain housing independent of their parents. 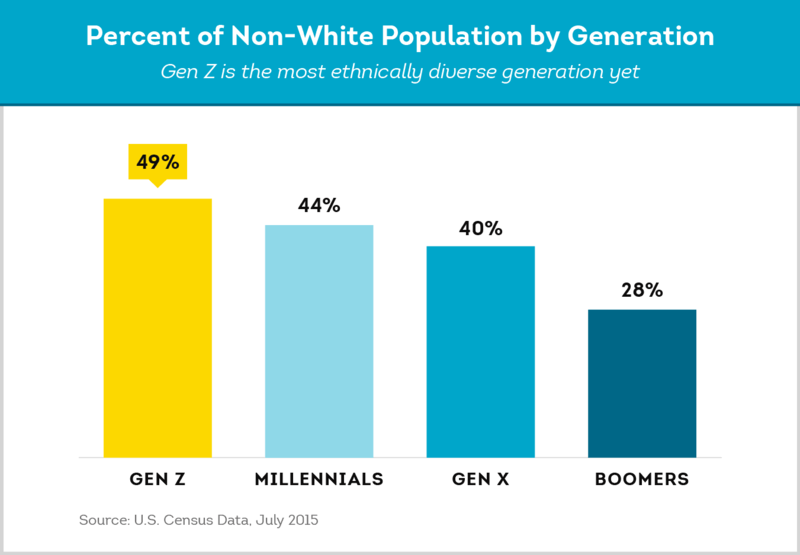 They are the most ethnically diverse generation yet, as nearly half (49 percent) of the population is non-white. All of them have grown up with the world at their fingertips, thanks to the digital resources that have been available all their lives. This impacts how they interact with and see the world, from being exposed to more global foods at an early age to having a more inclusive and accepting attitude. As the generation matures, we will gain a clearer understanding of their likes and dislikes, but we can already take a look at what is influencing this generation. A majority (60 percent) of millennials choose to rent because they value flexibility and convenience. On the other hand, a survey conducted by Better Homes Gardens and Real Estate revealed that 97 percent of Gen Z teens expect to own a home in their lifetime. Having grown up in a recession with Generation X parents might suggest that they have a more realistic expectation. According to Ryan Jenkins, a leading speaker on millennial and Gen Z, 77 percent of Gen Zers expect to work harder to achieve their goals, and more than half expect to work into their ‘60s and ‘70s. Millennials are known for their innovations, but Gen Z is positioned to become the most entrepreneurial generation yet. According to Mashable, 72 percent of current high school students want to own their own businesses and 76 percent hope they can turn their hobbies into full-time jobs. With the high load of student debt and low pay facing many millennials, Gen Z members are open to education opportunities other than formal degrees. According to a Sparks & Honey study, 74 percent of Gen Z believe there are other ways of getting a good education than obtaining a college degree. An AddecoUSA survey backs up this data: only 38 percent believe that college provides good preparation for a career, and many are concerned about the cost of education. Having grown up on YouTube tutorials, Gen Z will likely seek out employers that offer on-the-job and development training. According to Entrepreneur, Gen Z cohorts have been shaped by the availability of on-demand media, and have come to expect personalization in areas outside of the digital world. They are tech-savvy, since they are the first generation to live in a world with high-speed internet, smartphones and social media platforms for the entirety of their lives. This means that they expect to find information and resources in an online format, and advertising tactics such as for rent signs and newspapers are not likely to reach these younger renters. Gen Z’s practical mindset means that when they do rent, they will look for affordability and stability, as opposed to the more free-roaming millennials. A BHG Real Estate survey suggests that Gen Z cohorts are willing to give up luxuries to achieve their goals of homeownership. Rent prices that allow them to save for a home and longer leases are likely going to be more appealing to this generation. Their highly mobile lifestyle also means that they expect a landlord to be up to speed with rental industry trendsand accept information in an online format. This includes online rent applications, online tenant credit checks, and the ability to pay rent online. They also source reviews from social media and reviews, so it makes sense to advertise on platforms that offer reviews from previous tenants. Rainmaker points out that attracting Gen Z renters means building a positive reputation for excellent service, customer satisfaction, and prompt response to maintenance issues and repairs. You should also have a proactive strategy in place to ensure your online reputation. Since technology and personalized experiences have been the primary influences on Gen Z, technology will be key to your success in attracting this generation of renters. This means having mobile-friendly websites with virtual tours and relevant content. If you hire a property manager, make sure they are well versed in technology and comfortable with electronic communication. Bring all your rental processes online and streamline them so they are easy to use. This generation is used to things happening immediately, so the ability to make a screening decision fast is important. With SmartMove, you can access comprehensive reports on your phone or tablet in a matter of minutes, allowing you to make a decision quickly. Since Gen Z cohorts expect landlords to be as tech savvy as they are, it’s important to that your tenant screening service be fast and able to complete everything securely online. SmartMove’s tenant screening process is optimized for mobile devices, and provides you with comprehensive reports on your potential tenant in a matter of minutes, making it a fast but safe screening solution that is ideal for both landlords and Gen Z renters. They will appreciate being able to provide their personal information through TransUnion, safe and securely online.